Fruit is a wonderful snack on its own, but when it comes to serving, it’s nice to be able to do something a little more interesting than just setting out a bowl of apples or grapes – especially when we’re coming up on Memorial Day and the summer barbecue/party season. A fruit salad is an easy way to dress up fruit as a side dish or for dessert, and this cocktail-inspired version is a little more festive than most. I actually first saw this fruit salad at Trader Joe’s, in the prepared foods section of the store, where they now offer a couple different kind of to-go, prepacked fruits and yogurts. I love mojitos and knew that I had to try the combination at home. I used a mixture of lime juice, sugar and mint as the base for my salad. For my fruit, I used a lot of things that I already had at home, like watermelon, honeydew, pineapple and grapes, and added in some fresh berries and papaya. All of these fruits go really well with mint and lime in general, so it’s no surprise that everything blended nicely when I tossed it all together. It was refreshing and a nice twist on plain fruit salad. If you’re feeling daring (and there are no kids around to eat the salad), try adding a splash or two of rum, as well. Feel free to use whatever fruit takes your fancy, but I would definitely recommend papaya and watermelon as staples. In a small bowl, stir the lime juice and sugar together to lightly dissolve the sugar. Chop the mint leaves gently and stir in. In a large bowl, combine all the fruits you will be using. Pour the lime mixture over the fruit and gently toss to coat. Refrigerate fruit until ready to serve. Next PostNext What is wondra flour? ya had me when I read Mojito………and I’m in the snow at this moment YIKES!!! I’d kill for a watermelon or a cantaloupe. Summertime is here!! Theres nothing better than eating some cold fruits to help you cool off. 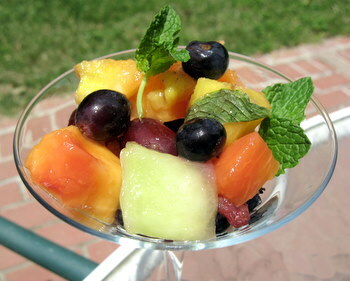 The mojito fruit salad looks delicious, I will definitely make this next time I go to the beach or as a treat to a barbecue. Another cool treat is to take grapes, put them in a zip lock bag and put them in the freezer for an hour. Frozen grapes are out of this world!! I have also done this in the past with frozen limeade concentrate and poured it all over the fruit. It’s a really good flavor and also keeps the fruit from turning brown. Its very refreshing. I want to try this!